When we left off in the last issue, we had just seen Khan and his friends stage a coup of the installation where they had been… developed and modified. It was a fairly simplistic, straightforward issue that established the character and gave us a nice bit of backstory to latch on to. It was lacking in the finer details and even some excitement, but it was a decent read nonetheless. The second issue however is not as good, largely because it delves too much into the narration, and at this point, the heavy-handed approach in that respect is working against the story, rather than for. I get that the entire story is framed as an interrogation before a Federation court and what not, and thus Khan is going to be telling the story. I just want to see the story, if that makes sense. With Johnson’s writing couching everything in the context of something akin to a personal diary that only visits the most significant moments in Khan’s young life, there’s no personal connection with the reader. This prevented me from connecting with the character at any levels. It was a dry read throughout, which was disappointing since I had high hopes for it. The way the events unfold is also something that I did not enjoy: the pacing is off and things rush by too fast. There’s no gradual lead-up, instead we get a blistering story that just leaves you in the wake rather than taking you along with it. Is the characterisation good? Kind of. The narration prevents you from really getting into the character sadly and so all you have to go on are the character’s movie appearances and the prose appearances, whichever ones you are familiar with. Or a combination of both. Being an origin story from his earliest days as an enhanced human, this is not the Khan that we later come to know and since the story is moving so fast, we don’t see him actually develop. It just happens because the plot demands it, not because the character demands it. A better way to tell the story would have been to present this completely as a flashback sequence where there is no narration from the character himself and there is no first person storytelling involved, as a result. I would have liked to see that more since it would have allowed the story to experiment with some of the other characters and give their viewpoints as well. The art is mostly the same as it was before. A little less spit and polish, but just as gorgeous. And I have to say that the cover art is just amazing. The art, overall, is fairly seamless, despite the fact that David Messina does the pencils and inks for the present day story set in the court while Claudia Balboni does the flashback pencils with Marina Castelvetro doing the flashback inks. Claudia ScarletGothika’s colours are the connecting life-line between the two and just as well since without her handling both stories, things could have been very disjointed. But, crisis averted before it happened. So might as well give the team credit for turning out a really good-looking issue. Overall, I’m disappointed with the issue, largely because of the story, and I’m hoping that it improves for next month when we get the third issue. 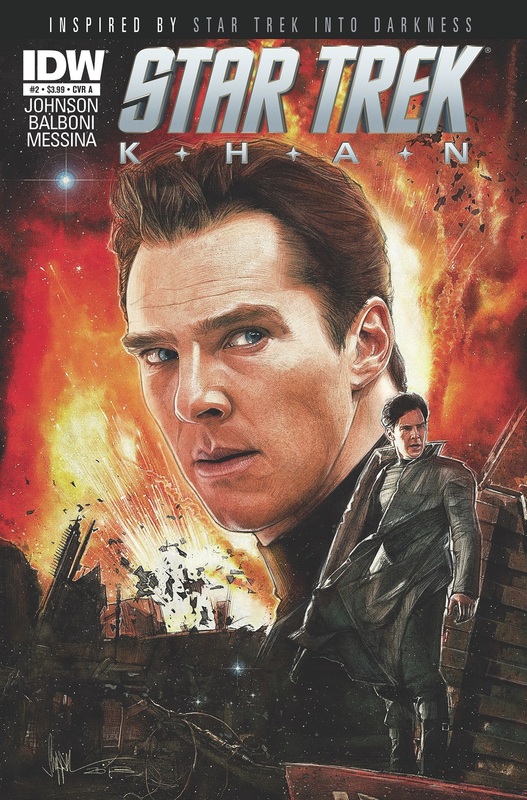 And I’m wondering whether or not I should get on that trilogy of novels that feature Khan and his cohort, mostly because of how different the stories are between the novels and the comics so far. I’ll keep you updated! Posted on November 13, 2013, in Comics Reviews, Review Central and tagged Claudia Balboni, Claudia ScarletGothica, Comics Review, David Messina, Khan, Khan Noonien Singh, Marina Castelvetro, Mike Johnson, Neil Uyetake, Review Central, Science Fiction, Space Opera, Star Trek, Star Trek: Into Darkness, Star Trek: Khan. Bookmark the permalink. 7 Comments.